Football signed by the 1974 Alabama Crimson Tide, the University of Alabama football team. 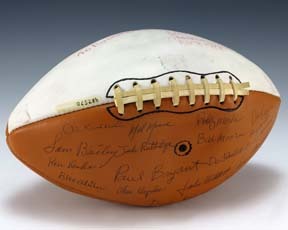 Notable signatures include Paul (Bear) Bryant and Ozzie Newsome. In addition, an inscription Gerald R. Ford can be found on the white quarter of the football.